Goalie controversy is now a thing of the past for the Anaheim Ducks. Well, it’s supposed to be. With Frederik Andersen now shipped off to Toronto, Ducks’ management has effectively handed the keys over to John Gibson, a promising 23-year-old netminder who’s never played more than 45 games in a season in his entire puck-stopping career. To mitigate Gibson’s lack of experience, Murray sought out the services of Jonathan Bernier who, like Gibson, was also once a promising 23-year-old netminder. Things haven’t exactly panned out that way for Bernier. He ended up losing his job in Toronto to a guy mainly known for running a goalie equipment group on Facebook. Not the storybook ending he would have probably preferred, but maybe the one he needed. He’ll have a blank slate in Anaheim and an opportunity to revitalize his career. Toronto Maple Leafs goalie Jonathan Bernier (45) during the NHL game between the Toronto Maple Leafs and the Carolina Hurricanes at the PNC Arena. 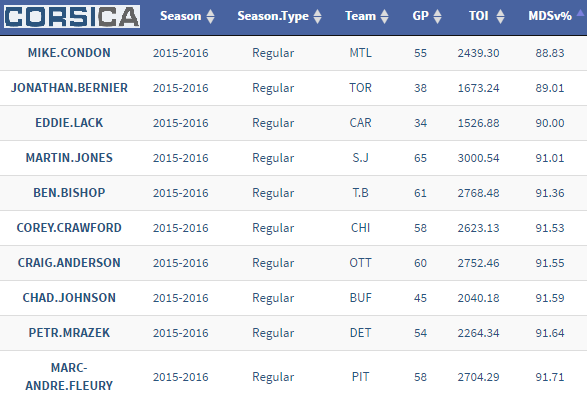 Bernier’s Toronto tenure was unstable at best, but 2015-16 was truly rock-bottom. After team president Brendan Shanahan stole Mike Babcock away from the Detroit Red Wings, there was a sense that things would start looking up for the much-maligned goaltender. In theory, they should have. The Leafs were an improved puck possession team in Babcock’s first year on the job, yet that did little for Bernier’s game. Perhaps it was the years spent under Randy Carlyle’s historically bad possession teams, or maybe it was all the losing. Whatever it was, Bernier’s dreadful play landed him in the minors on a conditioning stint. To his credit, he shone for the Toronto Marlies with three shutouts in four starts. That stint has often been cited as a turning point in his season, but there’s little evidence to support that claim. Called back up to the Leafs in mid-December, Bernier was sporting a .895 save percentage in all situations well into February. A slight improvement on his atrocious .888 before being sent down to the AHL. A handful of quality starts late in the season may have very well saved Bernier’s NHL career, bumping his final grade up to .908 (still well below average). That would end his Leafs career with a mediocre .915 save percentage. If last season was any indication, he’s drifting away from that aggregate score. 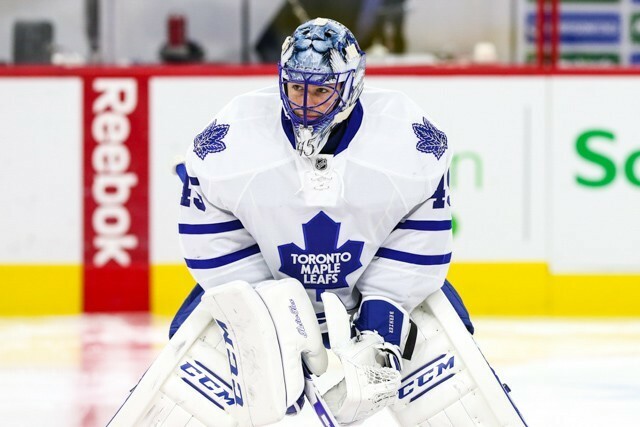 Anaheim is undeniably a better situation for Bernier compared to those rocky Toronto years. Even with a questionable-at-best off-season, this Ducks’ roster is clearly superior to the Leafs’, especially on the back end. Bernier will be insulated by the likes of Hampus Lindholm, Josh Manson, Sami Vatanen, and Simon Despres (to name a few). Regardless of how he actually performs, his life should be a bit easier. At least that’s the hope. No one really knows yet what to make of this Ducks’ team. They’re clearly weaker up front, but the biggest change is behind the bench, where Carlyle will take over for Bruce Boudreau. Based on last year’s numbers alone, the Ducks project to be one of the best teams in the Western Conference. That’s without factoring the loss of talent up front and the uncertainty behind the bench. Given just those two factors, it’s hard to imagine that Anaheim will be running away with the Conference (let alone sail into the post-season). Carlyle’s teams have historically struggled in suppressing shot attempts, which is one of the most reliable predictors of team success. Anaheim won’t be as bad as those Leafs teams were, but Bernier’s life won’t be quite as cozy as he might be imagining it right now. Ducks’ management isn’t quite ready to fork over 60 to 70 starts to Gibson, so Bernier will have ample opportunity to prove himself. Oddly enough, Bernier was actually one of the league’s best goaltenders at stopping high-danger shots on the penalty kill last season. Anaheim possessed the league’s best penalty killing unit in 2015-16, so he could potentially make an already elite group even better. It’s the medium and low-danger shots at even strength where Bernier struggles, though, and struggles badly. He was second to last in both categories among goaltenders who played a minimum of 1,500 minutes last season. NHL goaltenders are expected to be near perfect on those easier shots from the outside, and Bernier was nowhere close to that. Anaheim’s defensemen are much more talented at keeping opposing forwards at bay than Toronto’s, but Bernier’s weakness here might render that point moot. Even if Bernier were to regress to his career averages, that would have him stopping pucks at a barely league-average rate. Not exactly awe-inspiring stuff. He’ll be better than he was last season, but that’s an incredibly low bar, to begin with. His penalty kill numbers are intriguing, and if he can start stopping the easy ones at even strength, he has a real chance at extending his NHL career. No pressure, Jonathan.